The Federal Government has again warned Nigerians against embarking on the perilous journey to Libya as a means of travelling to Europe for greener pastures. Senior Special Assistant to the President on Foreign Affairs and Diaspora, Abike Dabiri-Erewa, issued the warning on Sunday while addressing reporters in Port Harcourt, the Rivers State capital. She asked Nigerians who might be insisting on embarking on such journeys to learn from the bitter experience of the returnees from the North African country. “Anybody thinking of going on that journey should just perish the thoughts because you are not likely to survive it,” Dabiri-Erewa said. Following the efforts of the Nigerian Government to repatriate stranded citizens in Libya, the presidential aide warned that Nigerians who still go to the country might have to face the risk. 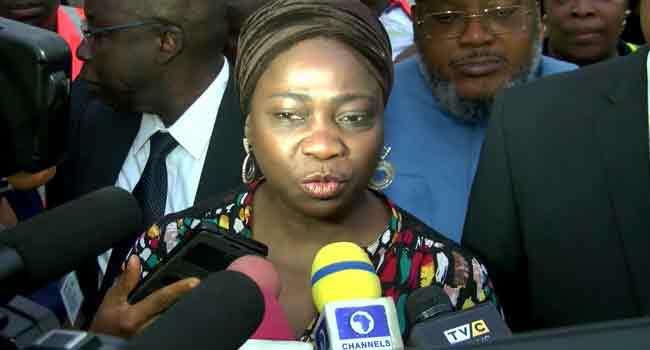 Dabiri-Erewa gave the warning following the arrival of 490 stranded Nigerians at the Port Harcourt International Airport, the first batch of more than 5,000 persons that are expected to return to the country. Those who were also on ground to receive the returnees were the Minister of Foreign Affairs, Geoffrey Onyeama, as well as heads of the National Emergency Management Agency (NEMA) and National Agency for the Prohibition of Trafficking in Persons (NAPTIP) among others. While Mr Onyeama briefed reporters on President Muhammadu Buhari’s directives which facilitated the return, the Director-General of NEMA, Mustapha Maihaja, explained why the government chose the airport for the process. On her part, the Director-General of NAPTIP, Julie Okah-Donli, said the repatriation process is a continuous exercise. She said: “Over 400 (people) came in and we are expecting another 500, about a thousand roughly but it’s a continuous exercise.